Leading Exporter of fluid bed dryer, batch type fluidized bed dryers, spin flash dryer, rotary dryer, spray dryer and continuous type fluidized bed dryers from Pune. We are manufacturing and exporting high-quality Fluid Bed Dryer, which is perfect for drying the processed items equally. This is completed with moderately high moisture substance to low moisture substance. Our Fluid Bed Dryer gives improved methods of drying products than the predictable methods of plate drying. These dryers inhabit fewer spaces and present not level drying. Our Fluid Bed Dryers are easy to dry and dry the material in the slightest moment as compared to plate dryer. 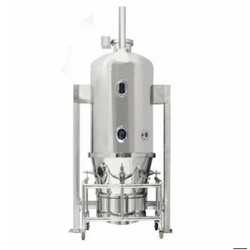 These bed dryers are designed in CGMP models of stainless steel and are available at industry leading prices in the market. Available with pneumatic locking as well as lifting for the container of product, these dryers are available with a specially designed silencer. These bed dryers are highly acknowledged for less space utilization as well as these are available in various technical specifications in the market. Our products are used in Fine Chemicals, Pharmaceuticals, Dyes, Food & Allied industries. We design these products with process control system as well as air handling equipment. These dryers use the conventional method of drying in order to dry the products in a reliable and efficient manner. 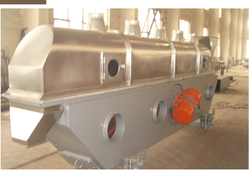 Fluid Bed Dryer consists of bottom distribution chamber and top fluidizing chamber. We are engaged in manufacturing a supreme quality range of Batch type Fluidized Bed Dryers, which are designed on the basis of GMP Regulation concept. These products are used for batch drying of granulates, powder products and agglomeration. Available in different technical specifications, these products are also used in various chemical industries. Further our dryers are also ideal for roasting applications of high temperature. We offer these products for top spray film coating to the clients and these products consist of control panels in order to provide high-temperature accuracy. These dryers are widely accepted to provide quick and uniform heating and are easily available at very affordable prices. Our products are available in the different capacity in the market and we manufacture these products using high-class stainless steel or mild steel. Available in modular designs, our dryers are highly acclaimed for their low noise level. Further, we offer these products with Pneumatic shaking system to our valuable clients. These dryers are fully automatic and are designed with the latest technology. With PLC operations, our dryers are used for flow free granular powder. Thus, these dryers have efficient energy utilization as well as good quality. Our company manufactures and supplies a superior quality range of Spin Flash Dryers, which are widely used to effect as well as effective methods of surface removal. These products are ideal for drying continuously the cohesive as well as non-cohesive pastes, liquids of high viscosity and filter cakes. Our products are featured with double shaft screw and are available at client friendly prices in the domestic market. These products are available in a variety of specifications in the market. Our spin flash dryers are manufactured with advanced technology and are heated with the help of air. Depending on the applications, these dryers have direct or indirect air heating and are designed with high precision. 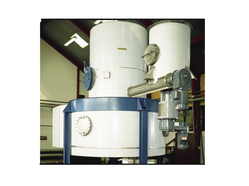 Our dryers dry in both actions including the fluidized condition as well as size reduction. These dryers are featured with unique feeding device as well as particle classifiers. We offer these products with various quality characteristics and these are ideal for Amino Acids, Dyes & Dye Intermediates, Starch, Pigments, and Gluten. These dryers are available with controlled temperature in the market and are manufactured under the special guidance of our experienced professionals. Our Rotary Dryer is a type of industrial dryer engaged to decrease or reduce the fluid moisture content of the material it is managing by bringing it keen on direct get in touch with a heated gas. 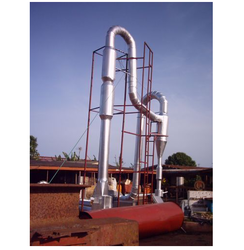 These dryers are fabricated of a big, turning cylindrical tube, generally carried by solid columns or steel beams. Material to be dehydrated goes through the dryer, and as the dryer take turns, the material is raised up through a sequence of inner fins lining the interior wall of the dryer. These dryers are available with customization based on different parameters and are available in a number of configurations and specifications. 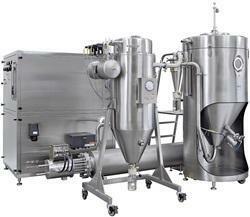 These rotary dryers are featured with a rotating shell, which acts as a stirrer and conveying device. We offer our products also with counter current as well as concurrent processes to the clients and our products are available with cost effectiveness in the domestic as well as international market. Moreover, these dryers are used for different applications of Ammonium Sulphate, Mineral Sand, Sodium Sulphate, China Clay, Citric Acid, and Effluents. These dryers are highly suitable for the non-food products and non-heat sensitive products. 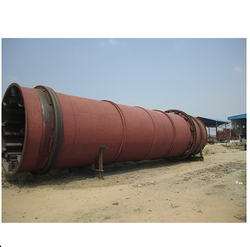 rotary dryers are manufactured from rotating cylindrical tube and supported with the help of the concrete columns. We manufacture a quality assured a range of Spray Dryers, which are extensively used for drying as well as particle formation. These dryers are used to convert the suspensions, solutions, and slurries in dry powder. Our products are manufactured using special designed as well as standardized method and used in various industries including Food, Pharmaceuticals, Chemical, Ceramics, and Detergents. We offer these products in various sizes to the clients and these dryers are available in custom-made designs in the market. 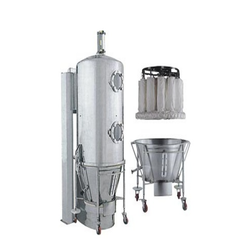 Used for products drying duty, these dryers have different flow patterns as well as atomization. In addition, our dryers are available for rotary disc atomizer system, two fluid nozzle system and pressure nozzle system. With fire fighting nozzles and explosion vents, these spray dryers provide inert environment drying. Thus, we offer these products with the compact layout to the clients and these are widely used for their user-friendly operations. Our clients can avail these products in pressure designs along with automatic or remote change over of nozzle. It is easy to operate these dryers and we offer these dryers with an option of single as well as two fluid nozzles. Thus, these can be customized as per the client’s desired requirements and needs. We are one of the foremost manufacturers and exporters of a broad array of Continuous Type Fluidized Bed Dryers that is broadly used to make dehydrated firms in particulate form in different industries like chemical, foodstuff, and drink. Our product range is specially fabricated for proper fluidization and best possible heat transmits and is also established successful pneumatic transport of the solids. Additionally, to this, these can also be tailored as per the give specifications detailed by our esteemed patrons. These products provide fluidization at very low air velocities and we offer these products with food functionality. Thus, all these dryers are tested on the basis of different parameters using excellent quality control systems and we offer these products with optimum performance to our respected clients. These dryers are handled through the cold air by cooling fan, hot air by drying fan as well as exhaust air by exhaust fans. Our bed dryers comprise product container that is pneumatically sealed and these are highly suitable for optimum heat transfer and proper fluidization. Additionally, these are also used for pneumatic solids transportation in an effective as well as efficient manner. Thus, these products are easily available with customization in the market. The Flash Dryers are used for the purpose of drying the wet slurry, paste, and cake which are otherwise difficult to dry out. The product is made using excellent quality of materials and we have a well set up unit for the purpose of manufacturing the products in a flawless manner and ensure that they are in tandem with the quality parameters set by the industry for these products. We offer the products to the clients are very cost effective rates. Flash dryers are available for free moisture removal and we offer these products in various designs, sizes, and specifications. These dryers are heated through the air in order to dry the slurry, paste, and wet cake in an effective and reliable manner. We source raw materials from the trusted vendors in order to manufacture these products with long lasting nature. These dryers are operated under negative pressure and provide hassle free performance. Our products are delivered within stipulated time period to our esteemed clients. These dryer occupy less space and available as per the international standards of quality. Ideal for diffusion-controlled drying operations, these flash dryers are also recognized as pneumatic dryers that are available with small footprints in the domestic market. Looking for Industrial Spray Dryers ?